London, January 23, 2015–The news that six Eritrean writers and journalists have been unexpectedly released is a welcome step from a country with an atrocious record on freedom of expression, PEN International said today. The five men and one woman – Ghirmay Abraham, Bereket Misghina (also known as Wedi Misghina), Meles Negusse, Petros Teferi (also known as Wedi Qeshi), Basilos Zemo and Yirgalem Fisseha (f) were released on bail in the evening of Jan. 21, 2015 after almost six years in detention without charge or trial. They were the last six remaining detainees of around 50 journalists and staff members of the Asmara-based Radio Bana arrested on Feb. 22, 2009. Initially detained in Adi Abito military camp northwest of Asmara, where they were allowed visits by family and friends, the journalists were later transferred to the nearby Mai-Sirwa maximum security military prison. All six journalists released from Mai-Sirwa have now returned home. 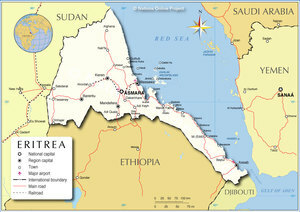 In the days following Sept. 18, 2001, at least 10 journalists from the Eritrean private press and 11 former members of the Eritrean government were rounded up and detained. To this day, at least six print journalists and all of the politicians remain detained incommunicado without charge or trial, while at least four of the journalists have reportedly died in custody. A further four print journalists arrested prior to and after September 2001 are also detained incommunicado without charge or trial. PEN International believes that these detainees are being punished for the peaceful expression of their views in writing. Four of the released writers – Negusse, Misghina, Teferi and Fisseha – had been adopted as ‘main cases’ by PEN International, a global organization of writers which campaigns for freedom of expression and an end to persecution of their fellow writers. Four of them are poets and one is a playwright. (For more information, see below). Ghirmay Abraham is a poet and journalist who worked for the national radio station Dimtsi Hafash as well as freelancing for Radio Bana until his detention. Yirgalem Fisseha is a well-known poet who at the time of her detention was working as a journalist for Radio Bana. Bereket Misghina (also known as Wedi Misghina) is a playwright, filmmaker, actor, and author who was a staff member at Radio Bana when he was detained. Meles Negusse is one of the country’s leading poets, who used to present a poetry program on national television. Also one of the founders of Tsigenay newspaper, at the time of his detention he was working as a freelance journalist for Radio Bana and was also a journalist for the Sports Commission. Petros Teferi (also known as Wedi Qeshi) is a writer and poet who was working as a freelancer for Radio Bana when he was detained. Basilos Zemo is a journalist who at the time of his detention was head of Radio Bana and the media section of the Ministry of Education’s Department of Adult Education and Media.